The Dive Deep, Rise Strong Retreat is your invitation to recharge yourself, mind, body and soul as you recalibrate your life on the Island of the Gods. The immersion in yoga means you are able to focus, without distraction, on deeper yoga practices. It’s time for yourself, time to recharge. This special retreat is a wonderful combination of yoga, meditation and self inquiry, giving you the resources to navigate life skilfully with a foundation for permanent and positive change. We carefully keep our retreat numbers small so you can receive individualised instruction. Limited places means you are guaranteed personalised attention but you will need to book early. Breakfasts, lunches, and dinners: your choice of delicious meals based on your dietary needs. All Retreat sessions. Workshops, Daily Deep Core Hatha/ Vinyasa blend yoga classes & Evening Restorative Yoga, Meditation, and Pranayama practices. 7am to 9am: Rise Strong with Deep Core Flow – Drawing from hatha, vinyasa yoga and somatic movement systems as well as the latest science available in anatomy and biomechanics the principles of Deep Core Flow enhances every style and level of yoga practice, the core techniques and practices apply equally to dynamic vinyasa and more gentle forms of yoga. Deep Core Flow is designed to access the deepest, innermost support structures of your body, offering an inherent lightness, power and support in movement alongside a healthy range of motion and stability. Deep Core Flow cultivates precision, alignment, balance, flexibility, grace, power, strength and stability. Somatic inquiry, breathing and mindfulness practices fuse with slow flowing vinyasa, creating an inquiry-driven exploration of yoga into how your structure really wants to move. Deep Core Flow is an expression of movement that creates deeper connectivity and strength so we may move through all of life with ease, stability and agency. 10.30 – to 12.30: Dive Deep – Mindfulness Session – At the start of the retreat, these sessions will be about developing the basics of Mindfulness to set strong foundations for open and honest connection with the self. As the retreat progresses, different elements such as the cultivation of loving kindness and different techniques for open investigation will be added in order unravel the limiting beliefs hidden in the deeper recesses of the mind. The practices themselves help to recalibrate the nervous system and restore mind and body as is, but whatever encountered will also serve as the basis of self inquiry and through application in the Rise Strong sessions, help build personalised tools for personal growth. 4 pm to 5pm: Rise Strong: Strategies to Thrive – Understanding & working with thoughts, emotions and the stories we make up. We will explore topics such as boundaries, honesty and accountability as ways to empower yourself and experience healthy relationships with others. These sessions will help you identify where and why we ‘split’ from ourselves and provide simple tools and techniques to bring yourself into wholeness. 5pm to 7pm: Dive Deep with Yin & Restorative Yoga & Meditative Practices – The afternoon will be a sweet and soft practice with mindful, methodical sessions combining slow flow, breath work and meditative practices. Explore moving meditation, Yin, Restorative that encourages mindfulness, self-awareness, self-compassion, and resilience. 7.00pm: Dinner – A yummy vegetarian feast on local Balinese foods. Arrival time on the first day is from 2pm. 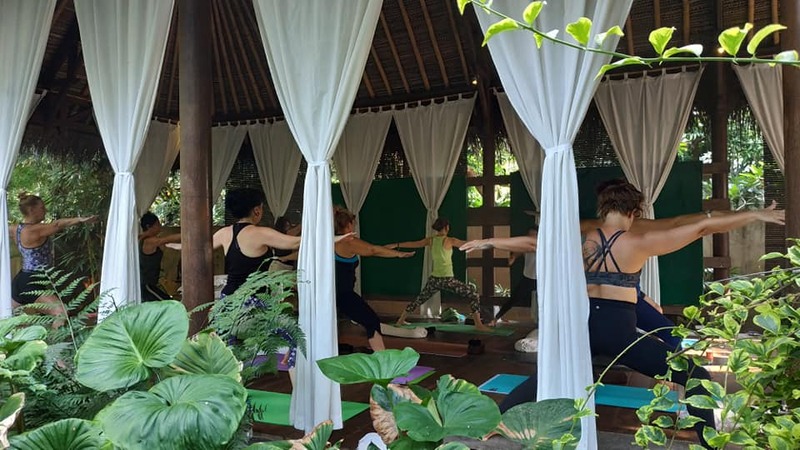 The first yoga class and formal group welcome is at 4.00 pm in the Yoga Hut, allowing you time to arrive, get settled into your room, eat well and perhaps have a massage or swim. Due to flights people arrive at all different times in the day but aim to be there as early as possible so you have time to unwind and relax before yoga. 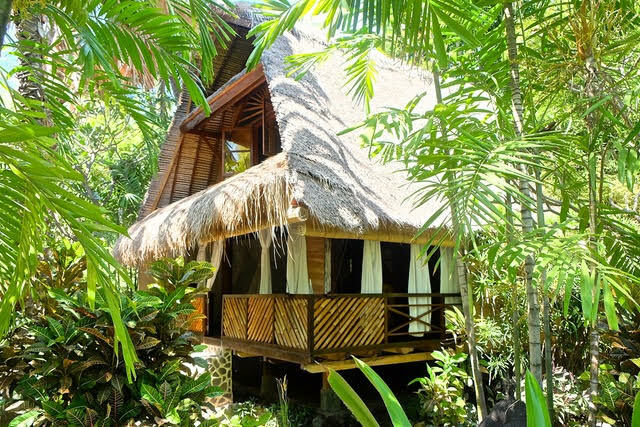 Villa Boreh is a Retreat Center with an Eco JungleConcept right on the beach with 2 Swimming pools and 1 Splash Pool. There is a beautiful day Spa, Beach Lounge, Sun bathing Beach Deck, and a Restaurant serving healthy fresh organic food, locally sourced food. The Resort also provides all kinds of Balinese excursions to enjoy in your free time. ​Yoga has since become an important way of life for him, one that is continually leaning towards ease and efficiency, joy and compassion. He believes that true healing and transformation can only happen when we take the self as an integrated whole and appreciate the relationships between its parts. It is this holistic form of Yoga he looks to share through every one of his classes for the nurturing of body, mind and spirit. Han is Co-Director of Teacher Trainings. Jen Hamilton is the Owner and Director of Core Life Yoga. Jen’s classes continue to evolve with over more than 25 years of practicing and teaching yoga. Jen’s playful personality, intuition and focused intelligence brings depth, clarity and vitality to her classes.You will be taken on a joyous journey into yourself through the union of breath, mind and body to establish mental and physical ease and stability. Jen’ classes are guided by her ability to combine anatomical focus with the freedom for individual expression. Jen has a warm and approachable style of facilitating that encourages self inquiry through curiosity, courage through vulnerability, playfulness and creativity through movement. Jen is passionate about using yoga to serve spiritual awakening. Jen believes the body is our vehicle for awareness – to be able to sense, feel and gain mastery over our tangible form invites deeper embodiment of our true self so we may flourish in our lives. The following points are key factors which you need to acknowledge when registering for our Bali Retreats. That a AUD $500 non-refundable deposit is due at the time of booking, with the balance payable no later than the date given on the relevant retreat page. To qualify for the Early Bird Discount payment must be made in full by the date given on the relevant retreat page. This payment includes AUD $500 non-refundable deposit. If I book within 60 days of the departure date I understand that full payment is required at the time of booking and I am subject to the refund policy. I understand that I am participating in an active Retreat in Bali and at times may find it mentally and physically challenging. There will be one or more yoga/meditation classes daily. The onus is on me, the participant, to ensure that I am physically fit to undertake the retreats. I take full responsibility for my own health and well-being during the program and understand the risks of travel in the developing world. I will not hold Core Life Yoga or any of the contractors and staff responsible for injuries or other medical or emotional problems that might occur. I understand that Core Life Yoga reserves the right to modify the itinerary, to accept or retain any person as a participant in the program at any time, or to withdraw the tour if they deem it necessary for the comfort, convenience or safety of the participants. I understand if I wish to cancel my reservation, it must be done in writing or via email and the cancellation will be effective as of the date Core Life Yoga receives it. The deposit is non refundable and is subject to the refund policy – listed further down. Core Life Yoga reserves the right to cancel a trip that is below the minimum of 10 participants. If this is to occur, Core Life Yoga will notify me in advance and give me a full refund, including the deposit within 30 days of cancellation. I understand that Core Life Yoga isn’t responsible for any additional expenses incurred in relation to this trip such as air tickets, passport and visa costs, nor any medical vaccination and preparations. An itinerary will be sent to all tour participants prior to departure. The itinerary is subject to change due to circumstances beyond our control including weather, political upheavals, as well as delayed/changed flights. Core Life Yoga reserves the right to change the journey leader, tour guide and/or accommodation should the need arise. Should any change be made to the itinerary, we will endeavour to ensure a comparable alternative is provided. Moderate fitness levels are required for the Yoga Retreats. The onus is on each participant to ensure that they are medically fit to undertake the retreat. All travellers require a passport valid for at least 6 months after the date of departure, together with onward travel documents and sufficient funds for the duration of the stay. The onus is on the traveler to ensure passports and relevant visas are current and valid. Sufficient blank VISA pages in your passport (not endorsement pages) are also required by certain immigration authorities; please ensure that you have at least 3 blank, double facing pages in your passport prior to travel. If there are insufficient blank pages in your passport then entry into a country could be denied. All passport holders should verify with their travel agent or relevant Consulate concerning visa entry requirements. If travellers are extending their journey to other countries, please establish entry requirements for those countries as well. Applications, costs and relevant documentation are the responsibility of the traveller. Core Life Yoga, their staff and their agents, cannot be held liable for any visas or travel documents not held by the traveller nor any costs relating to refused travel by Airlines or the authorities. Please note that we require minimum numbers for the journeys to operate. Should the minimum number of participants not be reached, Core Life Yoga reserves the right to cancel a trip that is below the minimum of 10 participants. If this should occur, Core Life Yoga will notify you in advance and give a full refund, deposit included, within 30 days of cancellation. Note that Core Life Yoga is not responsible for any additional expenses occurred in relation to this trip, such as air tickets, passport and visa fees or medical vistas in preparation. No refunds will be made for no-shows or any other unused services. Individuals are responsible for their own Personal Insurance. Core Life Yoga highly recommends all participants protect themselves and their trip investment by purchasing an accredited Travel Insurance Protection Plan. Your Personal Travel Insurance should include trip cancellation insurance. Personal items, such as jackets, cameras, purses and daypacks are the sole responsibility of the owner. 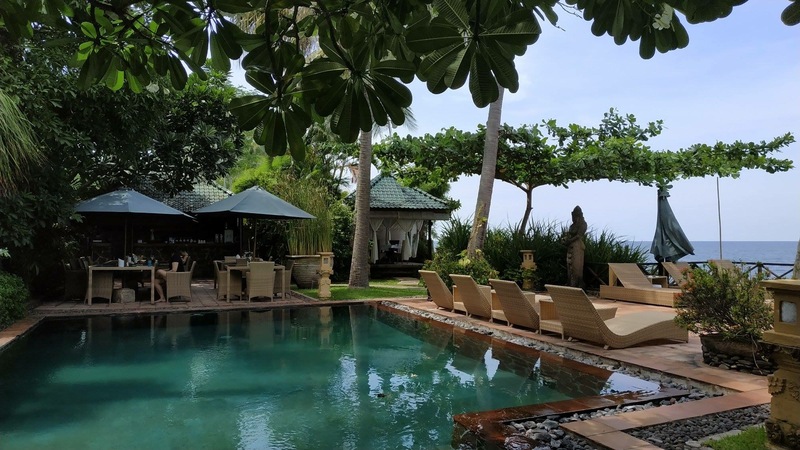 The Bali Retreat does not enter any known areas which are affected by Malaria, and the risk of exposure in Bali is very low, however Dange Fever is throughout Bali. However please consult a general practitioner or travel clinic and discuss all travel related medical questions prior to travel. Please check for all required immunisations with your nearest travel clinic or general practitioner and establish what precautions will be required. Special requests and dietary preferences should be specified at the time of booking. Whilst every effort will be made to fulfil these requests, Core Life Yoga cannot guarantee that these requests will be met. Core Life Yoga reserves the right to change or amend this policy at anytime. The current policy is always applicable.